Stretched out, the DNA from all the cells in our body would reach Pluto. So how does each tiny cell pack a two-meter length of DNA into its nucleus, which is just one-thousandth of a millimeter across? The answer to this daunting biological riddle is central to understanding how the three-dimensional organization of DNA in the nucleus influences our biology, from how our genome orchestrates our cellular activity to how genes are passed from parents to children. Now, scientists at the Salk Institute and the University of California, San Diego, have for the first time provided an unprecedented view of the 3D structure of human chromatin—the combination of DNA and proteins—in the nucleus of living human cells. 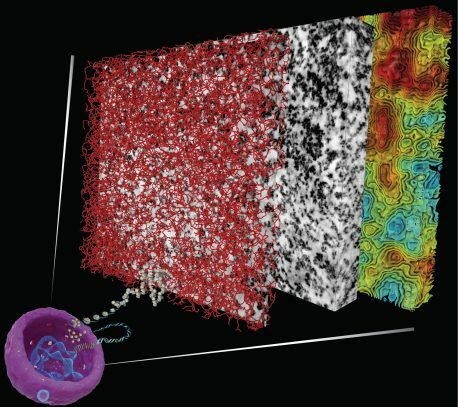 In the tour de force study, described in Science on July 27, 2017, the Salk researchers identified a novel DNA dye that, when paired with advanced microscopy in a combined technology called ChromEMT, allows highly detailed visualization of chromatin structure in cells in the resting and mitotic (dividing) stages. By revealing nuclear chromatin structure in living cells, the work may help rewrite the textbook model of DNA organization and even change how we approach treatments for disease. A new technique enables 3D visualization of chromatin (DNA plus associated proteins) structure and organization within a cell nucleus (purple, bottom left) by painting the chromatin with a metal cast and imaging it with electron microscopy (EM). The middle block shows the captured EM image data, the front block illustrates the chromatin organization from the EM data, and the rear block shows the contour lines of chromatin density from sparse (cyan and green) to dense (orange and red). Credit: Salk Institute. Ever since Francis Crick and James Watson determined the primary structure of DNA to be a double helix, scientists have wondered how DNA is further organized to allow its entire length to pack into the nucleus such that the cell’s copying machinery can access it at different points in the cell’s cycle of activity. X-rays and microscopy showed that the primary level of chromatin organization involves 147 bases of DNA spooling around proteins to form particles approximately 11 nanometers (nm) in diameter called nucleosomes. These nucleosome “beads on a string” are then thought to fold into discrete fibers of increasing diameter (30, 120, 320 nm etc. ), until they form chromosomes. The problem is, no one has seen chromatin in these discrete intermediate sizes in cells that have not been broken apart and had their DNA harshly processed, so the textbook model of chromatin’s hierarchical higher-order organization in intact cells has remained unverified. To overcome the problem of visualizing chromatin in an intact nucleus, O’Shea’s team screened a number of candidate dyes, eventually finding one that could be precisely manipulated with light to undergo a complex series of chemical reactions that would essentially “paint” the surface of DNA with a metal so that its local structure and 3D polymer organization could be imaged in a living cell. 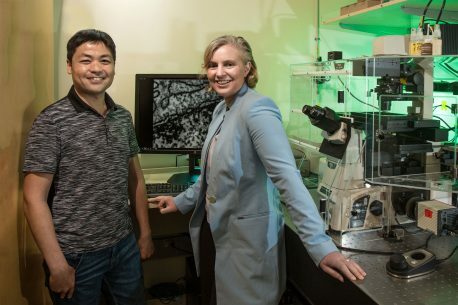 The team partnered with UC San Diego professor and microscopy expert Mark Ellisman, one of the paper’s coauthors, to exploit an advanced form of electron microscopy that tilts samples in an electron beam enabling their 3D structure to be reconstructed. By combining their chromatin dye with electron-microscope tomography, they created ChromEMT. The team used ChromEMT to image and measure chromatin in resting human cells and during cell division when DNA is compacted into its most dense form—the 23 pairs of mitotic chromosomes that are the iconic image of the human genome. Surprisingly, they did not see any of the higher-order structures of the textbook model anywhere. From left: Horng Ou and Clodagh O’Shea. Credit: Salk Institute. What O’Shea’s team saw, in both resting and dividing cells, was chromatin whose “beads on a string” did not form any higher-order structure like the theorized 30 or 120 or 320 nanometers. Instead, it formed a semi-flexible chain, which they painstakingly measured as varying continuously along its length between just 5 and 24 nanometers, bending and flexing to achieve different levels of compaction. This suggests that it is chromatin’s packing density, and not some higher-order structure, that determines which areas of the genome are active and which are suppressed. With their 3D microscopy reconstructions, the team was able to move through a 250 nm x 1000 nm x 1000 nm volume of chromatin’s twists and turns, and envision how a large molecule like RNA polymerase, which transcribes (copies) DNA, might be directed by chromatin’s variable packing density, like a video game aircraft flying through a series of canyons, to a particular spot in the genome. Besides potentially upending the textbook model of DNA organization, the team’s results suggest that controlling access to chromatin could be a useful approach to preventing, diagnosing and treating diseases such as cancer. Future work will examine whether chromatin’s structure is universal among cell types or even among organisms. Other authors included Sébastien Phan, Thomas Deerinck and Andrea Thor of the UC San Diego. The work was largely funded by the W. M. Keck Foundation, the NIH 4D Nucleome Roadmap Initiative and the Howard Hughes Medical Institute, with additional support from the William Scandling Trust, the Price Family Foundation and the Leona M. and Harry B. Helmsley Charitable Trust.